Health and Wellness Greyhound health is pretty much standard. 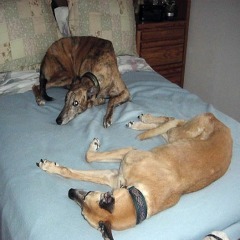 By and large greyhounds are healthy ex-athletes, not prone to genetic anomalies and are a long lived breed. Most of the problems associated with greyhound health are track related injuries. Generally not a lot of money at the track goes toward their Vet bills so broken bones, cuts and hygiene take a back seat unless the greyhound is a big winner. I have seen greyhounds with untreated track injuries go on to live long happy lives with their new people so do not be deterred when you hear that they may have some issues. Our Murphy had been left out in a field in Florida and was covered with ticks and fleas. He had such deep seeded sores on his back that the Vet told us they may never grow fur in those spots. But after a couple of weeks on antibiotics, some good food and lots of love he had a wonderful full coat with no sign of any scaring. There may have been broken bones which were not set properly or at all, but again with good Veterinary care you will have a wonderful companion for many years. This dog may not be able to take walks for miles on end but around the block usually is not a problem. With patience these walks may be increased. Some Vets will prescribe supplements which help with easing discomfort to achieve good greyhound health. The food that they receive while racing is soft and provides no benefit to the teeth and gums of the greyhounds. Most rescue groups will have a dental done prior to placing the greyhounds. So when you adopt a greyhound you must continue good dental hygiene. Often times this is part of the adoption fee along with neutering, shots and bathing. At home dental care is very important and will only take a few minutes of your time but the benefits are many. As with people, poor oral health can cause many other physical problems, so make sure you have a tooth brush and canine tooth paste on hand and use it often. Another common ailment seen in retired racers are corns on the pads of their feet. It is believed that the lack of a layer of fat on the pads to absorb shock when racing can cause this condition. It is very easily treated but if left unchecked will cause limping. Take a look at this dog health guide site for more information. The Dog Health Guide and Dog Health Handbook are both helpful references on common canine ailments such as dog mange and dog skin disorders.